You obviously want success in your organization. You put in long hours getting the work done. You know your own specializations inside out. But how many hours per week do you actually spend studying cutting-edge techniques for boosting productivity and performance? Create routinely exceptional customer experiences that produce raving fans! Fortunately, you have the power to increase success in each of these areas. You can do it using your authority, being persuasive, training others, modeling new techniques and behaviors, or simply explaining new ideas. No matter what your role in your organization, this award-winning Workbook Set will show you 12 powerful ways to stop wasting time, effort, and resources and start tapping the hidden potential in your enterprise. Packed with over 80 pages of potent content and delivered with two valuable bonuses, it will help you, your colleagues, or staff increase profitability, boost morale, and produce success — all while also dramatically reducing stress. Adele, after reading the first few lines, the only thing I can say is, every company needs this book! Price: US $47. Click now to get instant access! This guidebook is jargon-free, easy to read, and divided into sections for fast navigation. And because it's interactive, you can type your ideas directly into the PDF forms provided as you answer the questions throughout. That way, you can print and keep a handy record of all of your responses using Adobe Acrobat or another program. This step-by-step guide is also interactive. You can type your ideas directly into the PDF forms provided to produce your plan. As with the Special Report, you can save and update your plan using Adobe Acrobat or another program. This powerful, success-blueprint generating tool will take to the next level with your team! 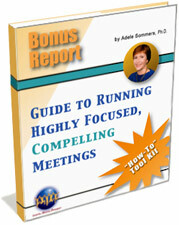 Want to stop dysfunctional meetings dead in their tracks? Now you can do it with this How-To Tool Kit for making your meetings hum and your attendees sing on key. No more sharps or flats to worry about when you have this guide book by your side! Concise enough to use in a group setting, yet complete enough to give you the A-to-Z tips you need, this guide has 7 potent step-by-step checklists that will erase your meeting headaches forever. It even includes a digital meeting cost calculator that will automatically estimate how much you may be investing  or wasting  on meetings! Why do some projects proceed without a hitch, and yet others flounder? One reason may be the type and quality of planning that people perform at the beginning. The ideal approach involves using a project plan. A project plan is a coordinating tool and communication device that helps people envision, craft, and document the best possible project approach. This comprehensive How-To Tool Kit will help you identify the potential twists and turns of your very next project or program. A series of 18 core questions walks you step by step through the process of uncovering issues that could otherwise emerge as the unexpected gotchas in your next endeavor. Use these questions on your own or with your team to arrive at the clearest possible picture of your project from the very beginning! Why you should balance the needs of personnel, customers, and offerings in four major areas of your enterprise (page 10). How to tell whether your enterprise is depending on shortsighted luck or far-sighted savvy in the area of personnel development (pages 22-24). 7 ways to aim personnel talents along their greatest strengths, and thereby build invaluable expertise (page 25). How missing information can easily become the Achilles heel of your business profitability (page 26). Why skill training can be the wrong cure (and a total waste of time and money) for many performance problems (page 27). 13 types of obstacles and barriers that can kill productivity, drag down morale, and erode your bottom line (pages 27-28). 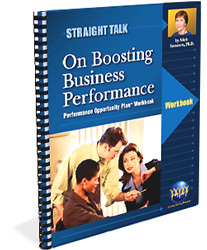 4 critical techniques your company can use to walk its talk and gain the best possible performance from personnel (page 29). 5 eye-opening reasons why projects fail, even when they start off with the greatest intentions (pages 34-35). 4 crucial tradeoffs that, whether you realize it or not, can make or break your projects success (page 35). Why highly profitable, cutting-edge firms routinely apply lessons learned from both successful and unsuccessful projects (page 38). The best ways to roll out completed projects smoothly, without disrupting business activities (page 39). Why what you dont know about your customers circumstances can cause you to drastically shortchange your products and services and thereby stunt your business potential (pages 44-47). Why conducting hassle hunts can pay off in spades by greatly increasing your customer loyalty and profitability (page 47). How to determine whether your customers think your products and services are easy to use (pages 48-52). Why you should make every effort to turn your buyers into loyal customers and then into raving fans (pages 53-56). The Straight Talk material was not heavy reading and motivated us to put some of your suggestions to work in our company right away. I know that we have improved meeting and project performance in our company — especially by eliminating wasted time and reducing risks. I especially enjoyed the interactive exercises in which we had a hands-on opportunity to learn the materials. I believe your information covering effectiveness and productivity will be of value to us as well. If business professionals want to get control of their operations, they should immediately get your reports and e-books. As soon as your principles are put into action, I am certain they will get results. 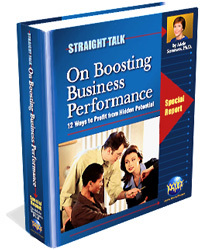 If someone is really serious about obtaining peak performance in his or her environment, the overall knowledge-based information presented in the Report and accompanying Workbook is a must read. No matter the project or self/personal enhancement being sought, there is information in this Report that anyone and everyone can use. The reading is informative, light, and filled with motivating knowledge that should lead the reader that is seeking to improve her environment to effortlessly flip from one page to another. Stories and quotes serve as inspiration and allow the reader to gain additional insight into the deeper meaning of performance opportunities. The Workbook takes that analysis to the next level by allowing the reader to participate in knowledge-based exercises that give a real hands-on approach to the material. I found myself reflecting on past experiences and gaining insight into how I might have addressed some situations differently. The forms are not only useful and very easy to work with, but they add real value to the entire product. YES, Adele  I want to order your Straight Talk Success Program so I can boost productivity, shore up morale, and drive new life into my profitability! Take it from me, most companies wait too long to figure how to prevent and solve business performance and morale problems. So, why delay until your organization is unraveling at the seams? Remember, to get started, you’ll just need a basic blueprint to begin moving things in the right direction. And thats exactly what my “Straight Talk Success Program” will give you, plus much more. Be assured it will not be complicated! In fact, you will be relieved to know you are shaping a new direction for your organization, and excited about the prospects for the future. And don’t forget that you have one full year to try it out  risk free — so you’ll have everything to gain and nothing to lose!